The Whippet is one of the most affectionate and compliant dogs of the real sight hounds. This breed of dog makes the perfect pet for anyone who wants a calm, quiet house dog and loyal companion. The Whippet is particularly gentle with children and can make an exceptional friend for them. It favors the indoors, however still enjoys running and playing outside. The Whippet is rather sensitive, both mentally and physically and cannot deal with vigorous treatment or ruthless corrections. The Whippet makes a great pet for an apartment or house, as long as it is taken for long walks or runs outside every day. It must have a cozy, warm, gentle bed. This breed of dog strongly dislikes cold weather and in no way could live outside. However, it can take walks and runs in the snow and cold weather. Overall, the Whippet loves to spend its relaxing time in warmer temperatures. This breed does not require a lot of grooming. Its hair is extremely short and fine. The Whippet has a life span of twelve to fifteen years. The biggest health concern associated with this breed is eye problems. Deafness is occasionally seen in the Whippet as well. It is suggested that the Whippet has routine eye exams to make sure there is no trouble. It is also important to note that this breed is sensitive to barbiturate anesthesia and prone to lacerations. The Whippet is an average sized sight hound, originating from the Greyhound breed. It may have derived from a mix between small Greyhounds and even smaller dogs to be used by peasants for hunting rabbits and other small animals in the eighteenth century. Along with hunting, peasants also used the Whippet breed for entertainment. They created a game called “snap dog” where bets were made on which dog could “snap up” the most rabbits before they could escape from a circle. The Whippet was mixed with ratting terriers as a way to increase their quickness and hunting abilities. However, the Industrial Revolution was when the true Whippet breed stared to develop. Tons of rural workers moved to industrialized areas and brought their Whippets with them as a form of entertainment, playing “snap dog.” However, without a plethora of rabbits, they found that their dogs would also race toward a waving rag. This game of rag racing became a hugely entertaining game for coal miners. 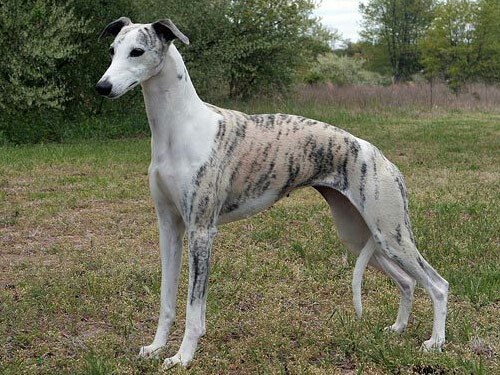 The Whippet was labeled as the “poor man’s race horse.” A family who owned a Whippet took great pride in their dog and also used it as a source of extra income and means of getting food. Along with these specific uses, the Whippet was also a great companion to the families. Whippet racing is still going on today, yet not as commercialized as Greyhound racing. It was officially recognized as a breed in 1888 and began to be appreciated for its unique appearance and relations to the Italian Greyhound. The Whippet slowly gained recognition and popularity, but with its elegance, grace, and friendly companionship, it has created quite a devoted following. Today, the Whippet is the most popular dog in the sight hound breed and is greatly respected for its skills as a show dog, lure-courser, racer, and family companion.